Volume Shadow Copy, another new Windows .NET feature, shifts the burden of backups and restores back to users. Some of the most significant new features in .NET focus on simplifying user support. One especially resource-intensive support issue involves individual file restores. How often have you gotten a phone call that starts off, “I was making changes to a spreadsheet macro that does a vitally important, mission-critical calculation and now my spreadsheet doesn’t work. Can you restore it from last night’s tape backup?” The answer, “I sure can and you’ll have it in a couple of days” rarely satisfies the user, so you must take time right then to mount the tape, locate the file in the catalog (if the user can remember its location and name), restore the file to a landing pad then copy it to the user’s folder. This imposes a signficant burden on IT staff and resources. A new service called the Volume Shadow Copy service shifts the workload of individual file restores to the user. 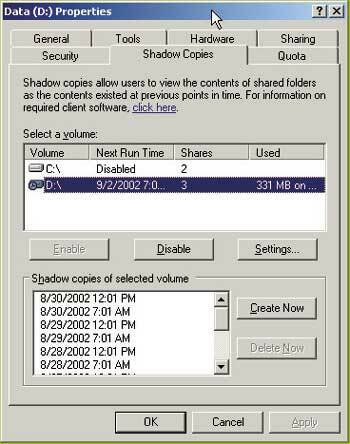 Volume Shadow Copy creates a database of changed data files. This database essentially caches historical revisions and presents them to users so they can be recovered without any intervention by system administrators. The Volume Shadow Copy feature is controlled via the Properties window for a volume. (See Figure 1.) The feature is disabled by default. There is only one database per volume, so volume shadowing can’t be enabled or disabled for individual shares. The database is encrypted and can’t be defragged. You can’t use Volume Shadow Copy on volumes hosted on the quorum drive of a cluster. The database can be placed on a different driver, and for best results, you should plan to provide a separate spindle or RAID array if you want to implement this feature. You can skip the database when doing tape backups on the theory that you already have historical copies on previous backup tapes that you can use if the Volume Shadow Copy database is lost. 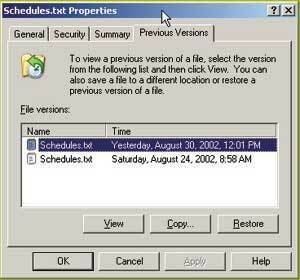 Viewing historical file revisions using the Volume Shadow Copy database requires a special extension to the Explorer interface that only runs on Windows XP or .NET clients. The feature isn’t supported on any earlier operating system versions. The client comes with .NET but must be installed separately on XP desktops via an installer package called Twclient.msi. The Explorer extension exposes a Previous Version tab on the Properties page for a file on a Volume Shadow Copy volume that is viewed via a network share. The second screenshot shows an example. The user can view the contents of each previous version and select which to restore. A variety of safeguards prevents accidental file overwrites. Figure 1. A user will see this page, showing previous versions of a document saved using Shadow Copy. Figure 2. Using Shadow Copy, the Properties page, shown here, can cut down on help desk calls. The Volume Shadow Copy service also supports backing up locked files. When a backup utility that uses the .NET Backup API encounters a locked file, it notifies the Volume Shadow Copy service, which takes a snapshot of the file that the backup utility can use in place of the original. This feature works even for volumes that don’t use Volume Shadow Copy to track historical file changes. If you use a SAN or NAS, the Volume Shadow Copy feature also supports taking snapshots of dynamic files for safe transfer to another location.